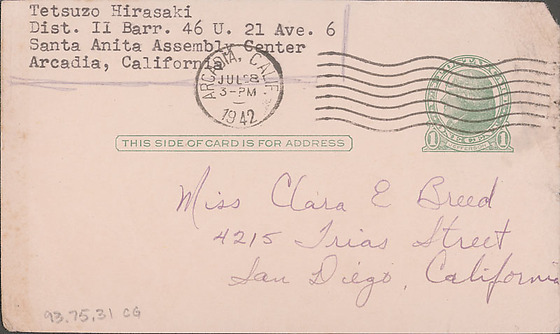 1 postcard from Tetsuzo (Ted) Hirasaki to Clara Breed. July 28/Dear Miss Breed,/This is just to let you know that I have received your letter and books for which I have not given you thanks. 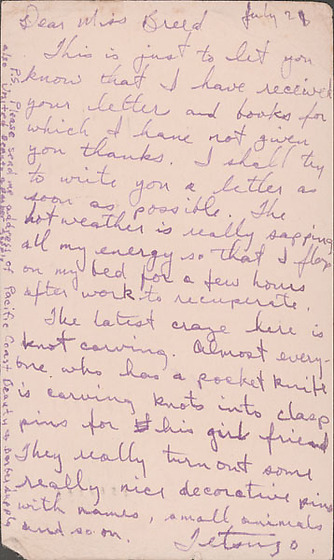 I shall try to write you a letter as soon as possible. The hot weather is really sapping all my energy so that I flop on my bed for a few hours after work to recuperate./ The latest craze here is knot carving. Almost every one who has a pocket knife is carving knots into clasp pins for his girl friend. They really turn out some really nice decorative pins with names, small animals and so on.